Dr. Robert Fisher is a conservation biologist with the US Geological Survey’s Western Ecological Research Center and works as part of a large integrated team. His focus has been on how natural systems are responding to the Anthropocene, and what types of resiliency they have or lack as it relates to maintaining ecological integrity and biodiversity. Additionally, through understanding individual species and community responses to perturbations through modern monitoring techniques, he and his team can determine appropriate management experiments or options to possibly recover resiliency. Geographically they have two foci, the first is southern California where urbanization and conservation planning bring various direct and indirect drivers of ecological change, and climate variability is currently extreme and drives landscape level drought and wildfires. Their second foci are the tropical islands of the Pacific Basin, from Palau and Papua New Guinea east to Hawai’i. These islands have also been driven by human change and are on the front line as extreme recent weather variability in the cyclone belt impact terrestrial ecosystems. Understanding how biodiversity was generated in this ecoregion is critical to managing its loss, and their team focuses across time and space (biogeography) to understand these processes utilizing molecular tools tied to expeditions of discovery in this poorly studied ecoregion. 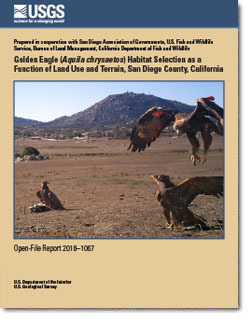 The San Diego Field Station is the site of research on golden eagles, endangered amphibians and reptiles, and more. Click on the "Science" tab for a comprehensive summary of this study site's projects. Bucciarelli, Gary M.; Suh, Daniel; Davis Lamb, Avery; Roberts, Dave; Sharpton, Debra; Shaffer, H. Bradley; Fisher, Robert N.; Kats, Lee B.
Treglia, Michael L.; Landon, Adam C; Fisher, Robert N.; Kyle, Gerard; Fitzgerald, Lee A.
Treglia, M. L., Landon, A. C., Fisher, R. N., Kyle, G., & Fitzgerald, L. A. (2018). Multi-scale effects of land cover and urbanization on the habitat suitability of an endangered toad. Biological Conservation, 228, 310-318. Tracey, Jeff A.; Rochester, Carlton J.; Hathaway, Stacie A.; Preston, Kristine L.; Syphard, Alexandra D.; Vandergast, Amy G.; Diffendorfer, James E.; Franklin, Janet; MacKenzie, Jason B.; Oberbauer, Tomas A.; Tremor, Scott; Winchell, Clark S.; Fisher, Robert N.
Mitrovich, Milan J.; Diffendorfer, James E.; Brehme, Cheryl S.; Fisher, Robert N.
Milan J. Mitrovich, Jay E. Diffendorfer, Cheryl S. Brehme, Robert N. Fisher, Effects of urbanization, and habitat composition on site occupancy of two snake species using regional monitoring data from southern California, Global Ecology and Conservation, 2018, e00427, ISSN 2351-9894, https://doi.org/10.1016/j.gecco.2018.e00427. Clause, Adam G.; Thomas-Moko, Nunia; Rasalato, Sialisi; Fisher, Robert N.
Oliver, Paul M.; Blom, Mozes P. K.; Cogger, Harold G.; Fisher, Robert N.; Richmond, Jonathan Q.; Woinarski, John C. Z.
Brehme, Cheryl S.; Hathaway, Stacie A.; Fisher, Robert N.
Fisher, Robert N.; Brehme, Cheryl S.; Hathaway, Stacie A.; Hovey, Tim E.; Warburton, Manna L.; Stokes, Drew C.
Tracey, Jeff A.; Madden, Melanie C.; Bloom, Peter H.; Katzner, Todd E.; Fisher, Robert N.
Tracey, J.A., Madden, M.C., Bloom, P.H., Katzner, T.E., and Fisher, R.N., 2018, Golden eagle (Aquila chrysaetos) habitat selection as a function of land use and terrain, San Diego County, California: U.S. Geological Survey Open-File Report 2018–1067, 13 p., https://doi.org/10.3133/ofr20181067. Biologist Robert Fisher tells a troubling tale of how wildfire in Southern California has disrupted the lives of frogs, shrews, fish, and salamanders (despite the latter's mythical fondness of flame). Adam Backlin, USGS Ecologist, talks about the potential dangers to the aquatic life in the streams around the Santa Ana Mountains as a result of the 2007 California wildfires. Robert Fisher, USGS Research Biologist talks about the overall impact of fires on the biology of the area. USGS Biologist, Robert Fisher, talks about the invasive species growing within the areas devastated by the 2007 California wildfires. A screenshot from the USGS film "Living with Fire". "Living with Fire" is a 11-minute USGS production exploring ongoing USGS research on wildfire science in southern California -- where the fire ecology is unlike any other region in the United States. Researchers from the U.S. Geological Survey, Taronga Conservation Society Australia, The National Trust of Fiji and NatureFiji-MareqetiViti have discovered a new species of banded iguana. New U.S. Geological Survey-led research suggests that even though amphibians are severely declining worldwide, there is no smoking gun – and thus no simple solution – to halting or reversing these declines.